President of Ireland Michael D. Higgins said that Ireland and Nepal are geographically far away but they do share many common humanitarian values and culture. Addressing the Special Ceremony on Nepal-Ireland Friendship Day, President Higgins said that Nepal and Ireland secured the membership of United National same day saying Ireland and Nepal share common views on many international issues. He also said that Ireland and Nepal is contributor to UN Peacekeeping serving different conflict zone to restore peace and order. President of Ireland also said that Nepalese constitution is one of the best democratic and inclusive constitutions. President Higgins also unveiled a poem of Irish Poet translated by ambassador Dr. Subedi in Nepali. Organised a special program to mark 20 years of establishment of diplomatic relations between Nepal and Republic of Ireland in Dublin, Nepali Ambassador to United Kingdom and Republic of Ireland Dr. Durga Bahadur Subedi said that it is a matter of privilege to welcome president of Ireland in the program. Ambassador Dr. Subedi thanked president of Ireland attending the program to celebrate twenty years of establishment of diplomatic relations. Addressing the program ambassador Dr. Subedi said that Nepalese are small in group in Dublin but they are active. “There are around 3000 Nepalese in Ireland but they have been organising various programs to promote Nepalese culture,” said Dr. Subedi. Ambassador Dr. Subedi said that Nepal’s new constitution is one of the best inclusive constitution which guarantees democratic and human rights of the people. Attended by large number of high level people from Ireland including chief justice, ministers and diplomats based in Dublin, member of Ireland’s Parliament also addressed the program. Conducted by third secretary of Embassy Bhupendra Ghimire, President Higgins also conferred eight Nepalese Deepesh Man Shakya, Ganesh Prasai, Gangaram Kandel, Jeevan Timilsina, Krishna Kumar Dangol, Nawaraj Koirala, Rajendra Kafle and Sarada Khatri Pyatrik for their contribution in promoting and protecting Nepalese language, culture and music in Ireland. This is a first such a public program organised by Nepalese Embassy in Ireland. 2nd July 2018. The Embassy of Nepal in London, Nepal Tourism Board, Nepal Ireland Society and NRNA Ireland are jointly organizing 'Nepal-Ireland Day' on 9th September 2018, aimed towards promoting the campaign of “Experience Nepal - Cuisine and Culture” and enhancing people to people relations between Nepal and Ireland. The event will take place at the Farmleigh, Phoenix Park in Dublin. The event was announced at ‘Nepal Evening’ programme organized in Dublin on 2nd July 2018. Gracing the ‘Nepal Evening’ programme as the Chief Guest, the convener of Ireland-Nepal Parliamentary Friendship Group and Member of Irish Parliament Ms. Maureen O’Sullivan said that she was delighted to see the growing link between Ireland and Nepal. She assured that the parliamentary friendship group would do its best to further enhance the ties between the two friendly countries. The ‘Nepal Evening’ was also organized to commemorate first year anniversary of the establishment of Ireland-Nepal Parliamentary Friendship Group and unveiling of the Nepal Heritage Cuisine Recipe Book which was published as part of the Experience Nepal - Cuisine and Culture (ENCC) campaign. 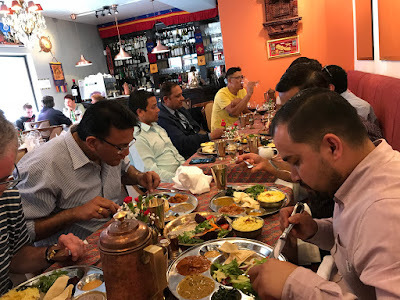 Nepalese restaurants in Ireland were handed over the recipe book and were requested to help globalize Nepal heritage cuisine through their respective restaurants. Irish Mt. Everest Summiteer of 2018 Ms. Louise Mcevoy and Irish trekker, Mr. Daire Rice successfully participated in the EBC trekking in 2017 shared their experiences and urged the audiences to visit Nepal to see the magnificent beauty of nature and experience the unique culture and warmth of hospitality. Similarly, Ms. Moira Lawson, Dr. Fiona Gallaher and Ms. Fran Lynch also shared their wonderful experience they had during trip to Nepal. Nepal Tourism Board (NTB), a government agency for promoting tourism activities in Nepal, has launched its global campaign named ‘Experience Nepal - Cuisine and Culture’ to promote Nepal’s tourism. The campaign especially targets to focus on internationalizing Nepalese cuisine in abroad. It may be noted that the Government of Nepal has declared the year 2020 as the visit Nepal year whose target is to bring two million tourists to Nepal. The Experience Nepal Campaign will serve as a step forward for supporting the dream project of Visit Nepal 2020. The Nepal-Ireland Day on the 9th of September will comprise a cultural programme with performances from both Nepalese and Irish artists. The event will also include an exhibition of photographs taken by Irish tourists, Nepalese Handicraft Stalls, Travel Agencies and Airlines Stalls and various other activities and performances. Nepal-Ireland Day is the biggest event in Ireland that commemorates the ever growing friendship and links between Nepal and Ireland. The event will be a showcase of Nepal’s culture, heritage and potentiality of trading hub as one of the top holiday destinations in the world. Mr. Shakya said - “Nepal-Ireland Society has been actively working towards different activities to establish tangible links between Nepal and Ireland through h its various activities. The high level visits between the two countries, collaboration in education, technology, research and opportunities for trade and investments would also be instrument in further promoting the close relationship”. President of Non-Resident Nepalese Association (NRNA) - Ireland, Mr. Nabaraj Koirala said that the association has been organizing different events to bring Nepalese community in Ireland together. He also mentioned that the association would be actively involved in organizing different segments of Nepal-Ireland Day to make this annual event successful. Nepal-Ireland Society has been organizing Nepal-Ireland Day since 2013 with support from the Office of Public Works (OPW), Ireland. More than fifteen thousand Irish people are expected to visit Nepal-Ireland Day this year. Organizers are desperately spreading publicity on social media through various channels with extensive advertisements. 24th Jun 2018. At the initiation of the Nepal Ireland Society, Nepalese community in Ireland participated in the Flavours of South Dublin Food Festival that took place in Rathfarnham Castle Park, Dublin. The event was organized by South Dublin County Council. More than 8,000 local people thronged the event which turned out to be one of the highly attended events of such kind in Dublin. Amongst many other countries, Nepal’s handicraft stall was a major attraction with a huge array of traditional handmade items such as pashmina shawls, lanterns and bags. As part of Nepal Tourism Board’s Experience Nepal – Cuisine and Culture campaign, the stand also served Nepalese Heritage Cuisine - Wo (Lentil Pancake), Aloo Sadeko (Potato Salad), Rajma Simi (Fried Red Kidney beans) and Lamb Chhoyela for tasting. The visitors were enthralled by the colourful Nepalese Handicrafts and appreciated the taste of the cuisine. Another segment in Nepal’s participation at the food festival comprised of Nepalese Heritage Cuisine live cooking demonstration. This was done by Mr. Bal Krishna Shrestha, a Nepalese chef who works in Radisson Blu in Dublin. The fully booked Irish audience keenly observed the preparation of Bara (Lentil Pancakes) and Lamb Chhoyela (Lamb Salad). They were inquisitive and full of praise when the prepared food was served to the audience. The president of Nepal Ireland Society and the Chief Co-ordinator of Experience Nepal – Cuisine and Culture campaign Mr. Deepesh Man Shakya said – “The participation in the food festival was very successful and meaningful. It helped to showcase Nepalese culture, food and handicrafts in Ireland”. Mr. Shakya added the society is planning to participate in similar other events in future to promote Nepal and many wonders that this country holds. 3rd February 2018. Nepal Ireland Society and Nepal Tourism Board organized an event in Dublin as part of Experience Nepal campaign to showcase Nepal’s authentic food. The event was participated by Irish Members of Parliament Ms. Maureen O’Sullivan TD and Mr. Sean Crowe TD. The event was also attended by members of Nepal Ireland Society and representatives of various organisations based in Ireland. At the event, Bhansa ghar, a local Nepalese restaurant served authentic Nepalese taste with Momo, Dalbhat Tarkari etc. It was very well received by the Irish Parliamentarians who were keen to know how the food is prepared. They showed interest in tasting more authentic Nepalese food in future. Nepal Tourism Board, through its Experience Nepal campaign, is planning to market 20 authentic Nepalese food worldwide. The effort to globalize Nepalese cuisine is spearheaded by Nepal’s tourism pioneer Mr. Karna Sakya and his team, under the campaign named ‘Globalizing Nepalese Cuisine Campaign (GoNCC)’. The chief co-ordinator of the Experience Nepal campaign and the president of Nepal Ireland Society Mr. Deepesh Man Shakya said more food tasting events will be organized in in future in Ireland and rest of the world once the recipes for 20 Nepalese food are ready. GoNCC is currently working on the same and the recipes are expected to be ready for distribution worldwide in next few weeks. At the event, a range of topics pertaining to mutual tourism promotion, trade and investment, collaborative humanitarian projects in Nepal, educational projects etc were discussed. The society’s General Secretary Mr. Gangaram Kandel welcomed the guests and society’s senior Vice-President Dr. Jane Fenlon and Vice-President Mr. Jivan Timalsina felicitated the parliamentarians with ‘khada’. Also present at the event were Nepal Ireland Society Treasurer Mr. Prakash Mali, Executive Committee member Mr. Mike Winterburn, Nepal Ireland Society support committee member Dr. David Weakliam and Action Aid Ireland CEO Ms. Siobhan McGee among others. The Embassy of Nepal in London, Nepal Tourism Board and Nepal Ireland Society jointly organized 'Nepal Ireland Day' in Dublin on 10th September 2017. The annual event was organized to promote Visit Nepal Europe 2017 campaign and celebrate the 18th anniversary of the establishment of diplomatic relations between Nepal and Ireland. Visit Nepal Europe 2017 campaign was announced by Nepal Tourism Board, National Tourism Organization of Nepal for tourism activities, to increase the number of tourists visiting Nepal from Europe in 2017 by 30-40% in comparison to the tourist arrivals in 2016. The event was jointly inaugurated by the speaker of the Irish Parliament Seán Ó Fearghaíl and HE Nepalese Ambassador to the UK and Ireland Dr. Durga Bahadur Subedi. Also present was a Member of Irish Parliament Sean Crowe. Mr. Sean Crowe is also a member of Ireland Nepal Parliamentary friendship group. Irish Mt. Everest Summiteers of 2017 Mr. John Burke, Mr. Rory McHugh and Mr. Terry Kelleher were felicitated by the Ambassador during the opening ceremony. In his keynote speech, HE Ambassador Dr. Durga Bahadur Subedi requested the Irish public to Visit Nepal. He said Nepal has 8 of the 10 highest mountains in the world, the country is blessed with pristine Himalayan trails and trekking routes but the most important thing is Nepal boasts the exceptional hospitality of its people where guests are treated like gods; he urged everyone to visit Nepal not once but multiple times and enjoy the divine experience the country has to offer. Referring to the relations between Ireland and Nepal, HE Ambassador added the link between Ireland and Nepal has taken an exceptional leap in recent years. He assured he will work tirelessly to continue and enhance this effort. The chief guest of the event, the speaker of the Irish Parliament, Mr. Seán Ó Fearghaíl said he was delighted to attend Nepal Ireland Day. He emphasized on the need of further developing the relations between Ireland and Nepal by frequent exchange visits of the parliamentarians and ministers and explore possible opportunities for the benefit of both countries. The speaker added Ireland is a multi cultured society; the contribution of Nepalese community in Ireland to strengthen the diversity in the country is really encouraging and praiseworthy. He assured he will definitely visit Nepal in near future after being impressed by seeing the photographs of Nepal on display at the photo exhibition. At the request of the speaker of the Irish Parliament, a minute silence was observed to remember the people who lost their lives in the devastating earthquake of 2015 and the recent floods in Nepal. Welcoming the guests, President of Nepal Ireland Society, Nepal Tourism Board Honorary Public Relations Representative and the Chief Coordinator of Visit Nepal Europe 2017 campaign Mr. Deepesh Man Shakya said - "We are celebrating this year’s Nepal Ireland Day to commemorate 18th Anniversary of the establishment of Diplomatic Relations between Nepal and Ireland and to promote the year 2017 as Visit Nepal Year in Europe. Visit Nepal Europe 2017 campaign was announced by the government of Nepal to increase the tourists going from Europe to Nepal by 30% in 2017 in compare to 2016. I feel proud to mention that, after the completion of 8 months of the campaign, the statistics show 40% increase in European tourists going from Europe to Nepal. From Ireland, it is even better and the number stands at 51%. " Mr. Shakya further added - "Today’s event is rather a special one. This is the first Nepal Ireland Day we are celebrating after the historic establishment of Ireland Nepal Parliamentary Friendship group in June. We have been working with the Irish Parliamentarians to strengthen relations between Ireland and Nepal and also increase collaboration between the two countries in education, research, technology, trade, and investment"
A mountaineering talk programme was also held where all Irish Mt. Everest Summiteers of 2017 shared their experiences. Ireland's renowned actress Ms. Aoibin Garrihy who did Everest Base Camp trek in April this year also shared her experience at the talk programme. The talk program was oversubscribed with more than 100 people attended the crowded hall. One of the major highlights of Nepal Ireland Day was the photo exhibition where 100 photographs taken by Irish tourists who visited Nepal in 2016 and 2017, were on display in specially crafted frames. The visitors were full of praise seeing the majestic landscape, culture and art depicted in the photographs. Artists from Sayapatri group and the local artists performed in the cultural programme attended by more than 500 Nepalese residing in Ireland and a ground full of Irish people who were very enthralled to see Nepal's culture and art. This year’s Nepal Ireland Day saw a record number of crowd with more than 10,000 Irish visitors. The opening ceremony was hosted by Nepal Ireland Society's General Secretary Mr. Gangaram Kandel and Joint Secretary Ms. Alison Irwin. Society's Vice - President Mr. Jivan Timalsina gave a vote of thanks. Nepal Ireland Society's Chief Treasurer Mr. Prakash Mali and Treasurer Mr. Balkrishna Shrestha expressed their satisfaction to see the success of the event. According to Mr. Shrestha, Nepalese residing in different parts of Ireland traveled to Dublin to attend Nepal Ireland Day. Nepal Ireland Society has been spearheading to strengthen the link between Ireland and Nepal at the highest level. The society’s effort to establish Ireland Nepal Parliamentary Friendship Group was finally materialized in June this year. The group provides Nepal Ireland Society a government level platform in continuing its work to build a strong bond between two countries. The venue for the event was provided by OPW. The event was part sponsored by South Dublin County Council, Dublin City Council and ICD Business School. On 11th September, Nepal Ireland Society and Embassy of Nepal London jointly organized Nepal Conference in Dublin. The conference was focussed on Trade & Investment, Education, Health and ongoing Humanitarian projects in Nepal carried out by Ireland based NGOs. Speakers from Dublin Institute of Technology (Mr. Liam McCarton), NIS Health Committee (Dr. David Weakliam), NIS Education Committee (Dr. Jane Fenlon), Musa Masala (Ms. Hannah Dennison), Concern Worldwide (Mr. Peter Doyle), Emergency Logistics (Mr. Will Holden), Nepal Leprosy Trust (Ms. Vera Mcevoy), Action Aid Ireland (Ms. Jo-Ann Ward), Tearfund Ireland (Ms. Emma Lynch), ,Umbrella Foundation (Ms. Naomi Gould), Plan International (Mr. David Williams), Trocaire (Mr. Conor O’Loughlin), Comhlamh (Ms. Ruth Powell) and University of Cambridge (Ms. Sorcha Ni Mhuimhneacháin) presented the work they have been doing in Nepal. President of Nepal Ireland Society Mr. Deepesh Man Shakya presented an overview of investment opportunities in Nepal. HE Ambassador Dr. Durga Bahadur Subedi in his keynote speech assured Embassy will always be in full cooperation to help NGOs who are carrying out various humanitarian projects in Nepal. He outlined Nepal’s potential as a business hub and requested Irish business houses to explore the possibility of investing in Nepal. The conference was hosted by Ms. Alison Irwin and chaired by Dr. Patrick O’Sullivan, Ms. Emma Lynch, Mr. Jivan Timalsina, Mr. Balkrishna Shrestha and Mr. Prakash Mali in different sessions.